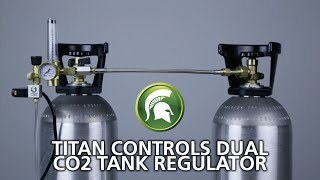 Tired of having to constantly change out your CO2 tanks? With the Titan Controls® Two Tank Regulator, you're now able to go twice as long before having to switch out your tanks. This device gives you the flexibility to run two tanks in sequence (one after the other) or to run two tanks simultaneously. It features a precise flow meter that allows you to tune it from 0.5 to 15 SCF/Hour (standard cubic feet per hour). This unit is built to last with a heavy duty brass body, high quality valves and a steel braided hose. 1 Amp/120 Volts/60 Hz.